The following steps describe how to install the MCP19110/11/18/19 Buck Power Supply Graphical User Interface (GUI) Plug-In. If MPLAB® X IDE is already installed, go to Step 2. If not, download MPLAB X IDE here. If an MPLAB XC8 C Compiler (v1.33 or later) - compatible C-compiler is already installed in MPLAB X IDE, go to Step 3. If not, you can download a free version of the XC8 compiler here. The XC8 user’s guide, installation instructions can be downloaded here. 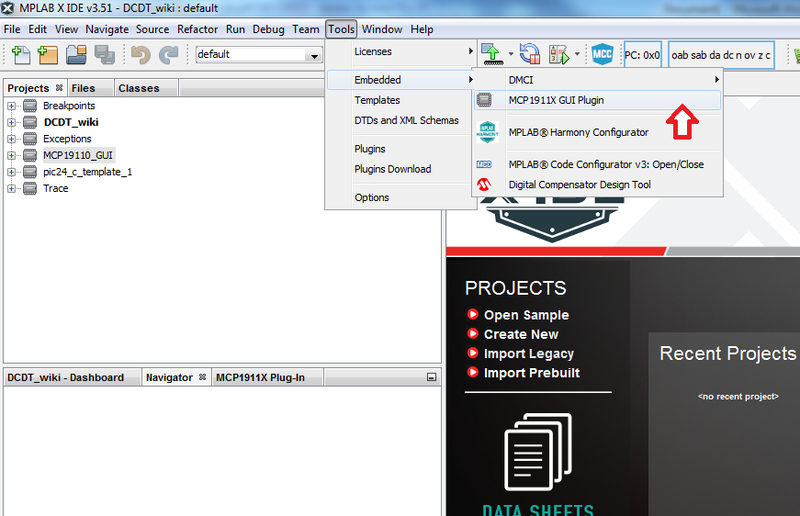 Download the MCP19110/11/18/19 – Buck Power Supply Graphical User Interface Plug-In Archive (*.zip) here. Unzip the MCP19110/11/18/19 – Buck Power Supply Graphical User Interface Plug-In archive, which contains the com-microchip-mplab-mcp1911X-buckpowersupply.nbm plug-in file. The plug-in file must be installed in MPLAB X IDE. To install it, open MPLAB X IDE. From the menu bar, select Tools | Plugins. This opens a new Plugins window. Select the Downloaded tab and click on the Add Plugins… button. Locate the com-microchip-mplab-mcp1911X-buckpowersupply.nbm file that was downloaded in the archive and click Open. Then click Install at the bottom left. Review and accept the License Agreement by checking the I accept the terms in all of the license agreements check box, then click Install. If a window opens indicating that the MCP19110/11/18/19 plug-in is not signed, click Continue. Once the installation completes, select Finish to close the Plugin Installer window. MPLAB X IDE will restart. After MPLABX restarts, Tools | Embedded | MCP1911X GUI Plugin. The GUI plugin will be launched at the lower left.